This year's prestigious Nordic Council Music Prize goes to Kari Kriikku. The Finnish star clarinettist enjoys great international recognition and is known as a pre-eminent champion of contemporary music. The awarding committee made its decision public on June 2, 2009; "Kari Kriikku is an extraordinary virtuoso on his instrument, the clarinet. His performance is characterised by flexibility and a positive musician's joy - he is a musician in the best sense of the word. In his genre he is a pioneering innovator of the solo concert form which has led to partnerships with most of the important contemporary composers, whose works he has then performed for the first time. 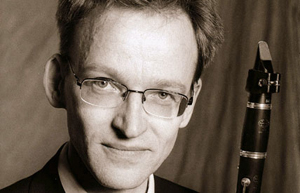 As a chamber musician he has also explored other contemporary music forms apart from classical music. Kari Kriikku has recorded a considerable number of CDs which span a wide range from C.M. von Weber to Kimmo Hakola and Magnus Lindberg also digressing in the direction of popular music. His stage talent further strengthens the picture of a striking and mature artist." Launched in 1965, the Nordic Council Music Prize is awarded annually by NOMUS, the Nordic Music Committee with delegates from Denmark, Finland, Iceland, Norway and Sweden. Every two years it is awarded for a work by a living composer. In the intervening years it is awarded to a performing musician or ensemble. The 2009 prize is worth DKK 350,000 and will be presented during the Nordic Council's Session in Stockholm at the end of October. For further information, visit the website of the Nordic Council.